The Pak-based terror camps were struck by 12 Mirage 2000 jets with 1000 kg of explosives at around 3:30 am on Tuesday. New Delhi: In relation to the Indian Air Force's (IAF) strike on terror launch pads across the LoC, the Pakistan Air Force (PAF) responded by scrambling F-16s to intercept them, but abandoned their pursuit considering the large size of the Indian formation, sources said. Sources also revealed that the operation was coordinated by the Western Air Command of the IAF. 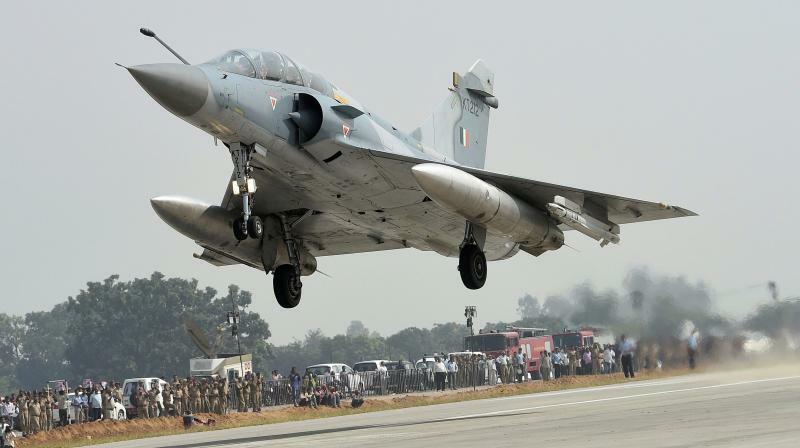 The terror camps at Balakot, Chakothi and Muzaffarabad were struck by 12 Mirage 2000 jets with 1000 kg of explosives at around 3:30 am on Tuesday. The targets included the control rooms of Jaish-e-Mohammad outfit that carried out a terror attack on a CRPF convoy in Pulwama in Jammu and Kashmir on February 14 in which 40 security personnel were killed and five injured. Pakistan Foreign Minister Shah Mahmood Qureshi, in a hurriedly summoned security meeting after the IAF operation, said that clouds of danger are hovering over Pakistan and that his country should not be worried over India's operation. "I have already said that I don't want to mislead the public. Clouds of danger are hovering over us and we will have to remain alert," Samaa TV quoted Qureshi, as saying.